What happens when a campaign is launched? You have created and launched your campaign create and launch your campaign. 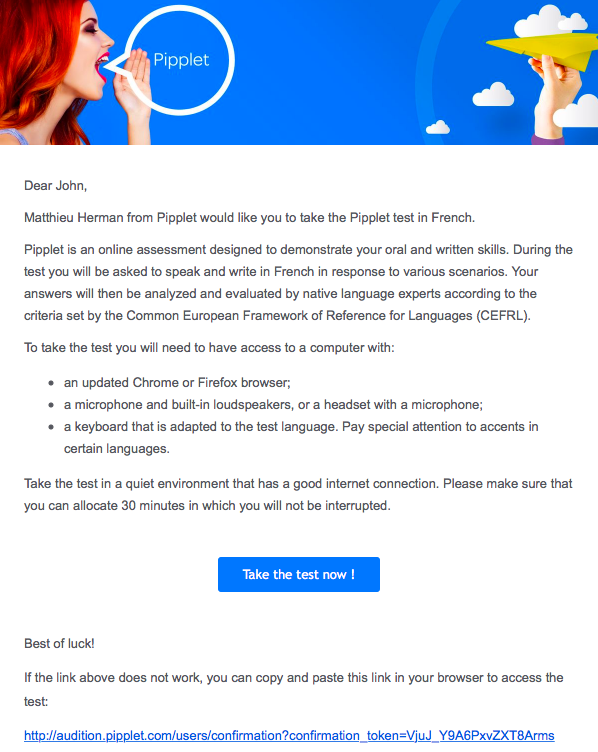 Your candidates will receive an invitation email to take the Pipplet test. The email will include all necessary information and instructions for the candidate to assure a smooth and simple test-taking experience. To follow the "Advancement" of your candidates in the test, you log in here, then click on the "Results" button. A list with your candidates&apos; results will be displayed. You can choose to display all of the candidates, or to sort the results by campaign. The "Advancement" column allows you to see where your candidates are in the evaluation. The "Results" column on the very right allows you to download your candidates&apos; certificate. When one of your candidates has taken the Pipplet test, he/she will be evaluated by one of our native-language professors within 24 hours and you will then receive the candidate&apos;s certificate by e-mail.